Action Picture is a screenprint from the series Cowboys and Indians. In this series Andy Warhol explores the Old West as an All-American collective history. Warhol’s work creates a commentary on mass media and the way in which contrived imagery can affect how we understand our history. Images of Geronimo, Annie Oakley and Mother and Child are based on characters in the Hollywood adaptation of our history and do not truly represent the roles that these real individuals historically played. Warhol interspersed recognizable portraits of well-known American “heroes”–John Wayne, Annie Oakley, Teddy Roosevelt, and General George Custer–with less familiar Native American images and motifs in his ironic commentary on Americans’ collective mythologizing of the historic West. Rather than portraying Native Americans within their historical landscape or Cowboys in their veritable forms, Warhol chose to portray a popular, romanticized version of the American West. The West that he chose to represent is familiar to everyone and can be seen in novels, films, TV series. Warhol’s Cowboys and Indians Suite is an ahistorical representation that mirrors a popular interpretation of the American West. Action Picture FS II375 is a fine example of Warhol’s aesthetic intent in its reduction of an entire heritage and way of life into a single “trademark” image. 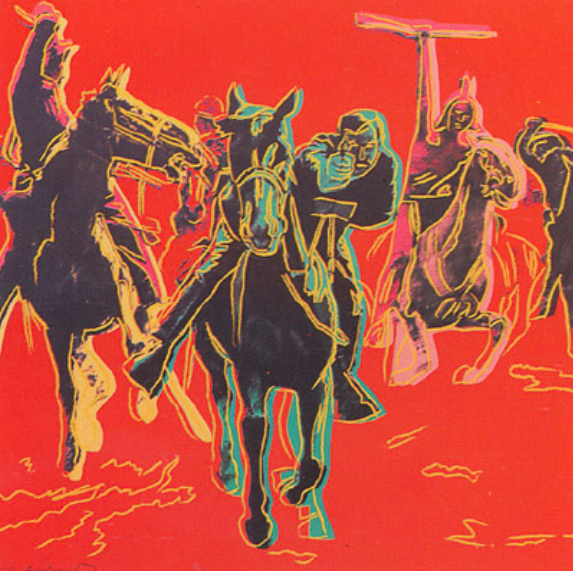 Andy Warhol created the Cowboys and Indians series during the mid-1980s. This is arguably his most prolific period. During this time, Warhol was forming bonds with a number of younger artists in the New York art scene including Jean-Michel Basquiat, Julian Schnabel and David Salle. Warhol saw a re-emergence of critical and financial success during this period of his life.Andy Warhol was an American artist who was a leading figure in the visual art movement known as pop art. Andy Warhol’s works explore the relationship between artistic expression, celebrity culture and advertisement that flourished by the 1960s. Andy Warhol’s Marilyn and Andy Warhol’s Soup Cans are some of the most recognized and collectible of his artworks.